This is an ongoing review of books available with Audible Narration in the Kindle Unlimited subscription program. I've been an Audible customer for several years and greatly enjoy the selection but it's too easy to burn through a credit each month when a good book is located. With Kindle Unlimited there is no monthly credit limit but the selection is more refined and I find it hard to locate desirable books. Below is a review of my favorite (and not so favorite) Sci-Fi and Fantasy books. The books kept coming up as a recommendation but I kept putting them off thinking them to be a starship troopers genre space warfare series but I was pleasantly surprised to be disappointed. There were several good twists along the 6 book series and the level of detail was enough to be satisfying but not so much as to be boring. The story kept moving forward for a very satisfying listen. If you like Clive Cussler style stories with adventure, mystery, and pseudo-history you'll enjoy this. It's a little slow to start with some seemingly unrelated events but as the story progresses it weaves into an epic science fiction adventure. It's an easy listen with plenty of interesting plot points without going overboard on inane detail. I had listened to the other books in this series and was pleased to continue listening to the series without wasting an audible credit. I started to get a little tired of the series since it didn't seem that the universe established by the book was fully realized. The characters enter into interesting and funny situations and there were more than a few laughs but I always thought the premise of the book could lead to even more interesting adventures. Regardless of my opinion, it's an interesting and fun listen. This book is epic. If you like the Lord of the Rings books you'll like this fantasy universe of elves, trolls, magic, and adventures that stretch time. While the universe reminds me a lot of Lord of the Rings the writing style is contemporary and easy to follow providing enough details to build a rich multi-layer story without going through superfluous narratives. The audio narration is very well done and the story will leave you satisfied in unexpected ways. Wow, just, wow. I've seen a lot of sci-fi and while the first part of this book reminded me of a Twilight Zone episode the unique ideas are captivating. While the content may seem dated by today's standards the story stands the test of time. I had previously listened to The Collected Stories of Arthur C. Clarke and absolutely loved all of the original and unique sci-fi ideas. This book didn't disappoint and it was exciting to see a story so completely thought out and finished. Finding the audible version of this was a pleasant surprise. It's an entertaining listen and interesting story but a little slow at times. I didn't really give this a fair chance but the plot and beginning just didn't grip me and came across as stereotypical. I might give this another try since I didn't make it more than an hour or so into the book. Similar to the Kingsfountain book I had trouble getting interesting in the plot and it seemed a bit stereotypical. I don't think I gave the book a fair chance before getting bored and moving on. I really wanted to like this and made it more than halfway through the first book but between jumping around the different and seemingly disparate characters I got lost and confused. This is hard science fiction that explores some interesting ideas about the future and was very interesting but I just couldn't get into it. After about 2 hours of listening, I decided to move on. The book was well written but slow moving with too much detail to take in. There are some interesting points that I liked but in the end, it didn't hold my interest to finish. The book started out interesting and kept my attention for about 4 hours but seemed to get bogged down in pointless details that didn't keep the plot moving forward so I gave up and moved along. I wanted to like this book but it was hard science fiction and while the environments tried to be unique and the characters interesting I found everything somehow ordinary and didn't get hooked on the plot line. I only listened to 5 hours of the first book before giving up. If your looking for a well supported OpenWRT or LEDE router available from Amazon this is a list of my findings and opinions. Advertise themselves as OpenWRT compatible and are listed on the LEDE supported hardware page. Well supported on LEDE project. Personal experience installing and running OpenWRT is good. ONLY V1 is supported and Amazon doesn't clarify what is sold. Contain a customized version of OpenWRT based on review. This is my experience installing Windows 8 RTM on my Acer One A0751H netbook. There are a lot of complaints about the interface changes in Windows 8 and although I happen to agree with most of them I was intrigued by claims that it uses less memory and performs better than Windows 7. What better test than to install it on my netbook than was originally designed for Windows XP Home. Although the netbook is several years old and not certified for Windows 8 I had success using Windows 7 on it and decided to test the claims about performance. Out of the box the Windows 8 installation had basic drivers for all the system components. To utilize the full 1366x768 display resolution the graphics card was capable of I had to install the Windows 7 version of the driver. Thanks to a posting on this forum for a download link and instructions. The Windows 7 Intel GMA 500 graphics driver will install in Windows 8 if you set the compatibility option for the driver's setup.exe file. It works. The screen display reacts slower than Windows 7 but considering the netbook's early generation Atom CPU is hardly fast enough to play YouTube videos and wasn't designed for Windows 8 I really can't complain. 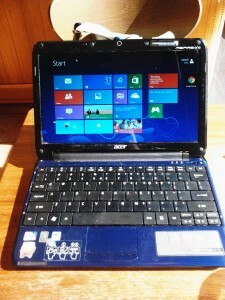 Start-up and navigation is acceptable and seems to add to the netbook's mobility and usability despite the hit in performance from using an unrecommended graphics driver. My MID 80003W Android Tablet (Wondermedia WM8650 according to the device about screen) rooted with Uberoid stopped working when I attempted to reset it to factory defaults. It would hang during the "Uberoid" load screen during device start-up. This post walks through the steps I followed to resolve the problem. Please note, I am not an Uberoid expert and am only sharing my experiences with my specific device. Download Uberoid WM8650 1.3.0 HYBRiD HoneyCombMOD v6 FiNAL from the forum posting. You'll find the link right before the FAQ. Free registration required for forum access. Locate FAQ #1 just below the download link and follow the directions listed. Tip - In FAQ step #4 my device was item 6, a M80003W 8". After re-rooting the device with the latest Uberoid package the tablet booted past the Uberoid load screen and now works better than ever. If your tablet fails to load past the Uberoid screen I hope these steps help clear your problem. If not, I suggest you researching the HcH TechKnow forum. Unfortunately my MID (Mobile Internet Device) 80003W is still a glorified ebook reader because it doesn't meet my particular needs. Anyone interested in buying it already rooted with the latest Uberoid mod? You can read about my original review here along with my experiences rooting it. I see Geeks.com has the MID 80003W listed as out of stock and I'm doubtful they will get more. 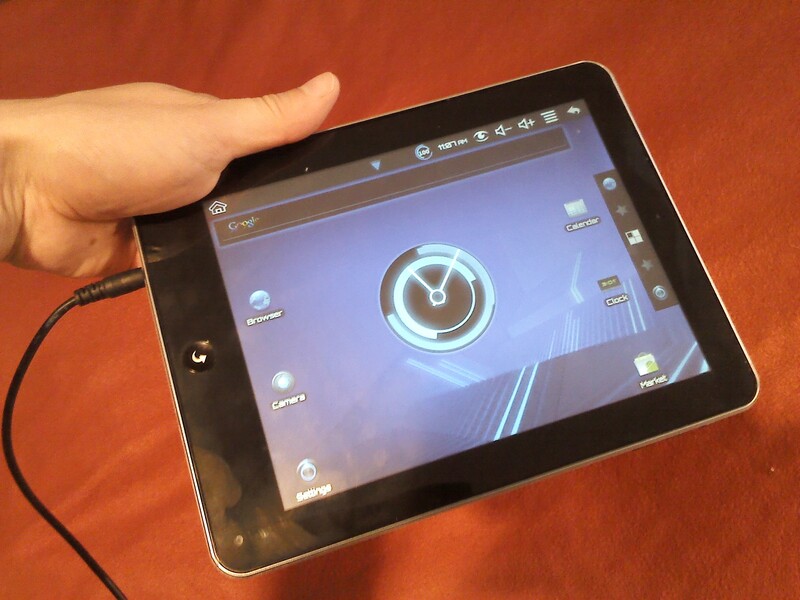 Update August, 24 2011: If you are attempting to root your tablet please check out the latest Uberoid mod instead of the one listed in this review. You can read about my experiences with the update on this blog entry along with links to the latest mod. Original Article:This is my review of a MID 80003W android tablet purchased from Geeks.com and my experiences rooting it. It's a no name MID (Mobile Internet Device) that comes up as model Wondermedia WM8650 when I check the device's about screen. 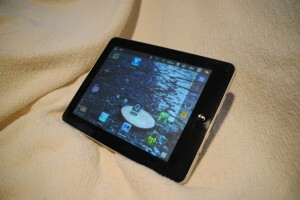 The device was of particular interest because it boasted 3G, 8" screen, and Android 2.2. Unfortunately I struck out on all three features. The 3G connectivity wasn't compatible with my AT&T SIM card because it doesn't have a SIM slot. The device does have a 8" screen but it is a low quality resistive surface which is more compatible with finger taps and a stylus instead of finger presses that a quality capacitive screen can sense. 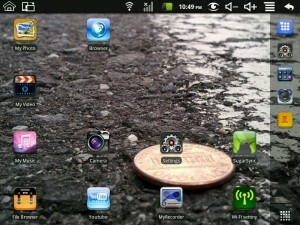 The tablet does have Android 2.2 but it was loaded with an unlicensed Android OS and filled with sketchy Chinese apps. Apparently an unlicensed OS can't access the official Android Market. The user interface was slow and applications were very unsettling. For a more comprehensive review check out this OSnews article on the device. Two features that are usually standard were surprisingly missing; a USB interface for connection to a computer and a head phone jack! There isn't anything I can do about the 3G and screen but rooting the device turned it into a half usable tablet. Unfortunately there is a lack of clear directions on rooting it and what ROM to use so below is the procedure I followed. You'll need a micro SD card, Windows computer, and several downloads. Download Uberoid_WM8650_2.2_v1.2.2_NL_v20110414-HcH Uberoid ROM from TechKnow. Note: To access the download you must be logged into the TechKnow forum. Free registration. Download SD Formatter and install it on a windows. Connect the SD card and use the SD formatter to create an empty FAT32 volume. Unzip the Uberoid download and copy the files onto the SD card. The wmt_scriptcmd file and FirmwareInstall folder should be on the root of the card. With the android tablet turned off, insert the SD card, and turn it back on. During startup the android tablet will read the SD card and install the firmware. It took about 4 minutes for the process to complete before the device rebooted into the new OS. Watch the screen because the SD card must be ejected when the firmware installation completes or the upgrade will run again after the device restarts. The final step was to blunder my way through the menu to calibrate the screen. Overall the process was straightforward and worthwhile. The device now runs faster and user interactions are more fluent. The sketchy Chinese apps are gone and the official Android Market is available.